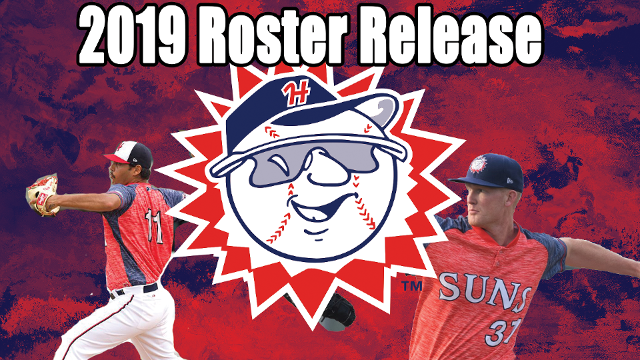 HAGERSTOWN, MD (April 2, 2019) – The Hagerstown Suns, in conjunction with the Washington Nationals, announced their Roster Tuesday. The Roster is loaded with talent and experience. There will be seven players returning to Hagerstown from last season, including Jackson Stoeckinger and Nic Perkins. Stoeckinger threw gas down the stretch for the Suns last season, spinning a 2.48 ERA through 18.1 innings in August and September. Meanwhile, Perkins, who started 2018 with the Suns, but only played one game before getting injured and finishing the season in Auburn, will have a second taste of the South Atlantic League. In addition to those, the roster boasts seven of the Nationals Top 30 Prospects, according to MLB.com. Tim Cate, Jake Irvin and Israel Pineda are a few of those top 30 prospects. Cate, Washington’s eighth-best prospect according to MLB.com, finished last season with two quality starts against the West Virginia Power and the playoff-bound Kannapolis Intimidators. Hitters only averaged .211 through the 17th ranked Irvin in 2018. The backstop who will catch these two pitchers is an on-base machine. Pineda, MLB.com‘s 20th ranked Nationals prospect, recorded a .341 OBP in 46 games last season. The Nationals’ 2018 draft class is well represented in this group, 11 of the 25 active men on the roster hail from last June’s draft class. Three of the Nat’s top five picks are on the Roster–Cate, Irvin and Gage Canning. Canning quickly moved up from Auburn to Hagerstown, after crushing the ball, to a tune of a .965 OPS in 14 games with the Auburn Doubledays in 2018. Finally, the Suns will reap both players gained in the deadline deal where the Nationals sent Gio Gonzalez to the Milwaukee Brewers. KJ Harrison and Gilbert Lara both played in the Midwest League last season and primarily manned the two corner infield positions for the Wisconsin Timber Rattlers. Hagerstown will open the 2019 season on the road April 4 against the Greensboro Grasshoppers. The team will return home April 11 to play the Asheville Tourists. For tickets and more information visit hagerstownsuns.com or call 301-791-6266.